Experiential marketing, social media influencers, user-generated content and voice search optimization are all topping the lists of the latest and greatest marketing trends, but one old-school standard still remains a top choice for marketers in-the-know – email. Email marketing is still an essential tool for generating and nurturing leads. According to a report from the Radicati Group, in 2018, the total number of business and consumer emails sent and received per day will exceed 281 billion, with a forecast projection of over 333 billion by year-end 2022. Benchmark reports show that 86% of business professionals prefer to use email when communicating for business purposes. According to Convince and Convert, people who buy products marketed through email, spend 138% more than people that do not receive email offers. Now that the staying power of email has been established, let’s drill down on how email can help us shred our business goals, such as customer experience, triggered communications, survey and feedback initiatives and brand loyalty. Lead generation, nurturing and, ultimately, conversion are the top objectives of email campaigns. The Subject Line – Your subject line should be strong, engaging and avoid anything that could be “spammy.” In addition, it is important to analyze the performance of your subject lines over time with your unique audience. For example, shorter subject lines might perform better with your audience if the majority of your users are viewing your emails on mobile. The Content – Emails should be short, sweet and to the point. Images are eye-catching, but the email should always be optimized for the potential image-blocker to ensure the user sees something even if the images don’t render. The CTA – Every email (even transactional ones) should ask for an action. The call to action should be clear, uncluttered and measurable. Buy Now, Book Now, Get Started – your call to action will vary based on your product or service, your brand voice and your relationship to the audience you’re emailing, but it should always be present. It seems that everyone wants a shot at our inbox these days and managing that inbox can seem like a full-time job. This inbox overflow makes the user less likely to give out his/her email address without good reason. Providing content in exchange for an email address (known as gated content) is an effective way to not only gain the elusive email address of a potential lead but to also vet user’s the relevant interest in your business’s product or service. Examples of gated content might be eGuides, whitepapers, infographics or video how-tos. Marketers often make the mistake of operating in silos and losing the lift that syncing up with other channels can offer. For example, if your blog gets a lot of unique visitors, this is a great place to push email leads to and also the perfect place to capture the email address of those unique visitors. Social media is another complimentary channel that can help support your email lead generation efforts. Really dig into where your traffic and leads come from with an integrated CRM or business intelligence software, and then use that data to build out a cross-channel strategy. 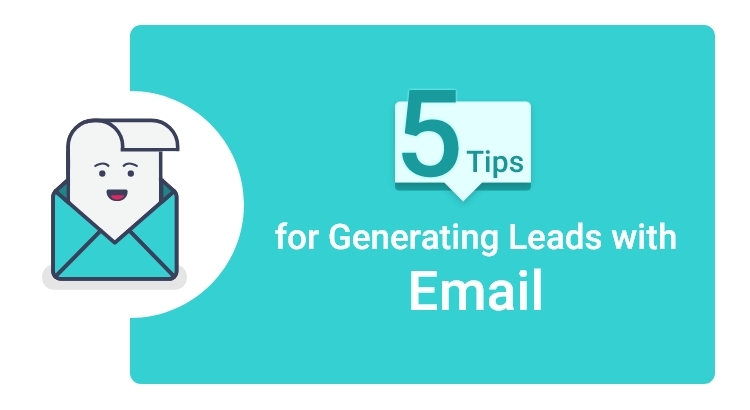 Segmenting your list and targeting your message is a proven way to get better results with email lead generation efforts. Check out your data and define the data points that make sense to the segment. Then, review how you can tailor the message to your audience for better results. To further personalize and send this tailored message to multiple recipients in your email list at once, you can use an email merge campaign tool. Your email campaigns will produce better results if you understand where your lead is in the funnel and tailor your message as such. For example, a user that downloaded your eGuide may be simply curious about your product, whereas a user that request pricing may be further into the buyer research process. Even when KPIs are on target and sales goals are trending upward, savvy businesses are still reaching for ways to feed their funnel with new leads. Email is a favorite channel for lead generation because it is cost-effective, easy to execute, ideal for testing and measurement, and, time has proven, it works!